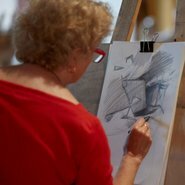 Whether you’re a first timer or an experienced artist, join us on the first Saturday of each month to celebrate the Gallery’s collection by sketching it. In September, we’ll be drawing in the exhibition Spacemakers and roomshakers in the contemporary galleries on lower level 2. Drop in any time between 11am and 1pm. All ages and abilities welcome. All materials are provided.